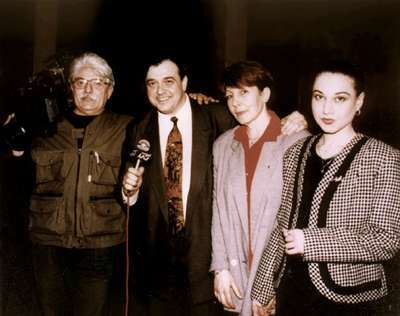 The crew of the show "Ot Igla Do Konetz" with Lubomir Stoykov on New Television (from left to right): Svetoslav Metchkouevski, Lubomir Stoykov, Snezha Hinkova and Krassimira Stoyanova. 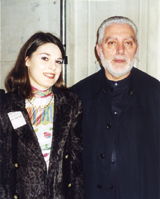 Krassimira Stoyanova - editor and reporter in the fashion show on New Television "Ot Igla Do Konetz"® with Lubomir Stoykov from the very first issue of the show which was broadcast on 18 February, 1995. She has been working in New Television since August 1994. She was born on 25 April 1971 in Bourgas. In 1990 she finished the English Language School in her hometown. In 1997 she finished the Sofia University "St. Kliment Ohridski" with an MA degree in Bulgarian Philology. In the period 1991-1993 she contributed regularly to the newspapers "Debati" and "1000 days". She can speak and write in English. 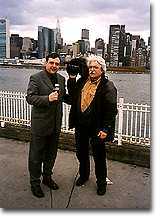 - cameraman-in-chief of the show "Ot Igla Do Konetz"® with Lubomir Stoykov on New Television from the very first issue of the show in 18 February, 1995 to the middle of 2000. He has been cameraman in other shows on New Television, such as "Architecturen Magazin", "Sol Klyuch", "Kalendar" and many others. He has been working as a cameraman-in-chief at the national television BTV since mid 2000. Click on the picture to enlarge it! He has worked as a cinema and television cameraman. He was born in Sofia. He has finished the State Institute of Cinematography in Moscow. He worked as a photographer from 1968 to 1969; as an assistant-cameraman, second cameraman and cameraman at the Studios for Feature Films from 1969 to 1993. He has shot primarily films that deal with history and culture: "A Ballad for the Redoubt" - director Iv. Danov; "Khan Omourtag" - director V. Mirchev; "The Apostle"- director Iv. Danov; "Filial Affection" - author Al. Beshkov, director P. Konstantinov; "Iliya Beshkov" - author Al. Beshkov, director P. Konstantinov and many more. Since 1999 he has been teaching at "Promedia" - the American Training Center for TV specialists. He received first award for the TV film "Filial Affection" at the "Golden Antenna" Festival in 1980. He has received medals for his contribution to the making of documentary films. He was nominated for best TV cameraman - "Golden Melon" for 1995. He is married; his wife's name is Krassimira and his daughter's - Anna. He speaks French, Polish and Russian. Yordan Petkov - cameraman-in-chief of the show "Ot Igla Do Konetz"® with Lubomir Stoykov since January, 2001. He was born on 29 May 1976 in Plovdiv. He has finished "Geodesy, Photogrammetry and Cartography" at the School of Civil Engineering and Architecture in Plovdiv. At the moment he is studying for a cinema cameraman at the Southwest University in Blagoevgrad. He has been working at New Television as a cameraman since 15 January 1998. Together with Lubomir Stoykov (author, host and director) he shot the fashion week "7th on Sixth" in New York. He is also one of the creators of the four-episode film "American Fashion 2001". He works as a cameraman in other shows on New Television, such as "Architecturen Magazin", "Dans Duga", "Lubimtzi" and many more. He works in the field of portrait photography, too. Snezha Hinkova - - assistant-director of the New Television show "Ot Igla Do Konetz" with Lubomir Stoykov since August 1995. Her sun sign is Pisces. She is in her fifties. She has a D. Sc. degree. She started her career in the cinema as a chemical engineer at the film laboratory of "Boyana Film" film studios. She has worked in the sphere of quality assurance check and as a technologist at "Video Film". She has also worked as an assistant-director at "Interfilm" film studios. She has also worked as an assistant-director at "Interfilm" film studios. She is a part-time lecturer at the Southwest University in Blagoevgrad; she teaches "Cinematographic Materials and Photographic Representation". In her free time she likes listening to classical music, going to the cinema or to the opera. She likes swimming and practicing fitness. Her favorite colors are blue and purple. Her favourite designers are Giorgio Armani, Paco Rabanne, and Thierry Mugler. Her favourite topmodels are - Carla Bruni, Iman, and Cindy Crawford. She likes reading spiritual literature and historical books.